The first F-16V fighter jet was delivered to the Republic of China Air Force on October 20, according to media reports. The Republic of China Air Force (ROCAF) took delivery of its first Lockheed Martin F-16 Fighting Falcon Viper (V) Block 70 multirole combat aircraft, according to an anonymous ROCAF source quoted by China News Agency. The first of four ROCAF F-16A/B fighter jets currently being upgraded by Taiwan’s state-owned Aerospace Industrial Development Corporation (AIDC) to the F-16V variant was handed over to the service at an airbase in Chiayi county in southwestern Taiwan on October 20. The October 20 delivery is part of the Republic of China Ministry of National Defense’s Phoenix Rising Project, which was launched in 2016 and aims to upgrade 144 ROCAF A/B Fighting Falcon combat aircraft to the F-16V configuration by 2023. Three other ROCAF F-16s are currently undergoing retrofitting at an AIDC plant, Lockheed Martin’s local partner in Taiwan, in Taichung. The total cost for the upgrade program is estimated at around $5.3 billion with Taiwan’s government recently authorizing additional funds. “A defense ministry official who spoke on the condition of anonymity stated earlier this month that the F-16 budget will increase from NT$129.6 billion to NT$140.2 billion (US$4.21 billion to US$4.56 billion),” I reported in September. “Extra funds will primarily be allocated for purchasing additional air-to-air missiles for the fighter aircraft.” Additionally funding is expected to be allocated in next year’s defense budget. Initially, the first upgraded batch of F-16Vs was to consist of 10 aircraft. However, delays in software testing in the United States reduced the number to four. Approximately 25 to 28 aircraft are expected to undergo modernization each year until 2023. The remaining three aircraft of the first batch are slated for delivery by the end of 2018. Two ROCAF F-16 A/Bs were already upgraded to the F-16V standard in the United States. In October 2015, the first of these upgraded ROCAF F-16 fighter jet in its V configuration conducted its maiden flight in Fort Worth, Texas. The AESA system mentioned by Lockheed Martin above is Northrop Grumman’s AN/APG-83 Scalable Agile Beam Radar. 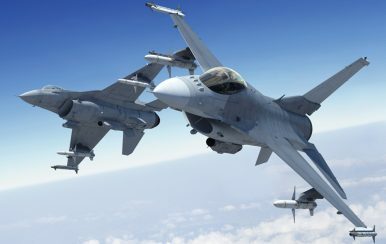 As part of its Phoenix Rising Project, the defense ministry is also seeking to purchase additional beyond-visual-range (BVR) air-to-air missile systems for its F-16V force including more AIM-120s, but also domestically designed and produced alternatives such as the soon to be operationalized Sky Sword II medium-range air-to-air missile 空劍二飛彈 or Sky Sword. Taiwan is considering procuring up to 66 F-16 Viper fighter jets from the United States.